This day my heart is aching. Joyce, my friend, my spiritual director, my counsellor, my guide, is at the end of her life. 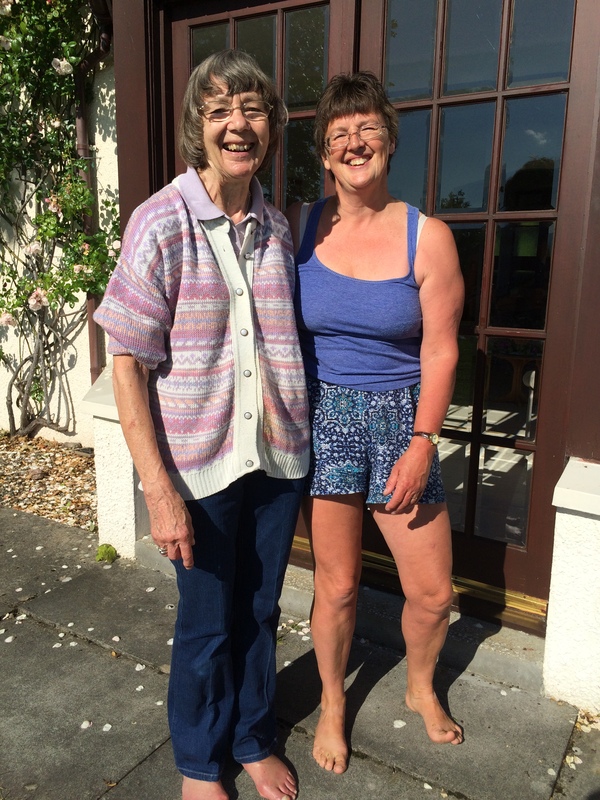 Joyce retired from teaching some 20 plus years ago, not to sit back and relax, but to come from her home in Lincolnshire to the Highlands, to a tiny village on the Black Isle, to help her friend to open a retreat house. Her friend had cancer and a limited time to live. And so the Coachhouse was born. Together they planned it, decorated, furnished and loved it. She always reminded me of a bird, a bright-eyed robin. She was diminutive, quiet, unobtrusive. My lasting memory is of her pottering about in the Coachhouse kitchen, stirring pans on the Rayburn, washing dishes, taking a 5 minute break to do the crossword. You would never guess from watching her what an incredible strong person she was. She guided so many through retreats, through personal dilemma, through tears and laughter. I would not be here writing this were it not for Joyce. When I was suffering a prolonged and intense depressive illness, exacerbated by past issues, by the betrayal of those I thought were friends and by a total failure of the psychiatric services to help me, Joyce took me into the Coachhouse and cared for me with love and compassion. She has been more a mother to me than my own ever was. I love her dearly and am devastated by news of her. She retired last autumn, as the Coachhouse was closing for extensive building work and refurbishment. She felt the time was right to hand over to those who had worked alongside her to bring the dream to its present point. She left as the autumn leaves were falling and the chill of the winter snow was there in the wind. I went to her farewell party, a gathering of those closest to her, many who were grateful for her dedicated help over the years. I managed to persuade her to have a photograph taken with me – she hated being photographed but she agreed on this one occasion! As she left, she hugged me tightly, told me how much I meant to her, How glad she was that I was in such a good place now. She would be back for trustee meetings, she said, and for the reopening of the Coachhouse in July. She hoped we could meet then. She was 84 years old. And had spent her entire retirement working for the good of others. This past week, I had a message to let me know that she has cancer, an aggressive form that is not treatable, and that she has only a few weeks to live. Her family are caring for her. She has indicated that she would like to receive emails from those who know her, that her daughter will read out to her. I want to write but I do not know what to say. I write this as a testament to the strongest, kindest, gentlest & most awesome woman I have ever met. Joyce, I am holding you in prayer and in my heart. I pray that your life’s ending will be peaceful and pain free, and that you will continue on your journey beyond this world. For me, you will forever be in the kitchen at the Coachhouse, in the garden that you loved, walking the lanes around Kilmuir, moving through the house quietly making sure that everything was in order and holding the wonderful silence you have created. I will miss you. I will grieve for you. I will continue on my path, knowing that I know myself more fully through your ministry. Go in peace, Joyce, to love and serve the Lord.